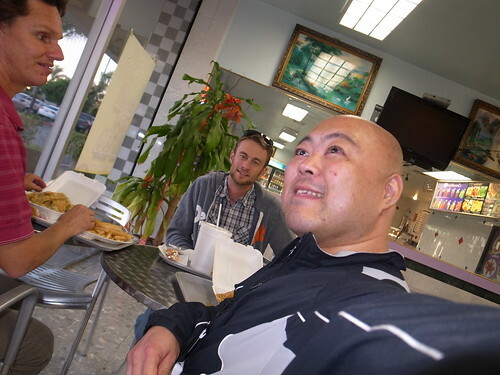 After crossing the parking lot, there is a Daniel's favourite Chinese take-out place. 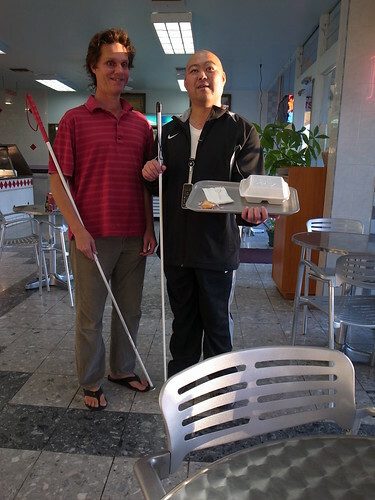 Most take-out restaurants have a counter right in front of entrance, so it is easy to approach to a counter after finding an entrance. As Daniel and I ordered our meals, we've got some food in plastic containers on a tray. The waitress told me she shall take trays to a table for me, and Daniel sayd I shall do it on my own. Daniel told me, it's I've gotta fix my veering and leveling problems! He told me to hold a tray and test the weight, finding the centre of the sides and grab a tray. Then, point the tray at the angle I want to move, and proceed my way. By taking his advice, veering was fairly easy, and I did not spill any food on tray, so I kept my food leveled! What the heck Daniel ordered at Chinese restaurant? If I heard it right, he got loads of french fries and vegetable tempura... aren't these western and Japanese combination! ?